In the Photographic archives at Lehigh University we found this photo of Quirk dedicating a new sculpture in Maginnes Hall, which is the Fine Arts Building. 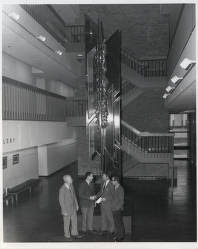 The Hall was opened in 1971 and once housed the University Bookstore. We do not know details on the sculpture yet. With the picture is the following text. Willard Ross Yates was a Dean who wrote a history of Lehigh. The dedication for the College of Arts and Science is interesting. It reads: Albert Bristol Maginnes "Alumnus and Trustee of Lehigh University, he excelled in many fields: the law, athletics, music and the fine arts. His life was one of integrity and service; his love of man, his gentleness and warmth of personality enriched those whose lives he touched. He enabled many men to come to Lehigh University; he advised them to the life of inquiry and truth which was his own." Mr. Maginnes was the Class of 1921. Below is an exterior shot of Maginnes Hall from the 1970's.